WTI crude oil could be due for a reversal from its downtrend as it broke above the top of a descending channel on its 1-hour chart. However, technical indicators are suggesting that bears might still be able to take over. The 100 SMA is below the longer-term 200 SMA to indicate that the path of least resistance is to the downside. In other words, the downtrend is more likely to gain traction than to reverse. 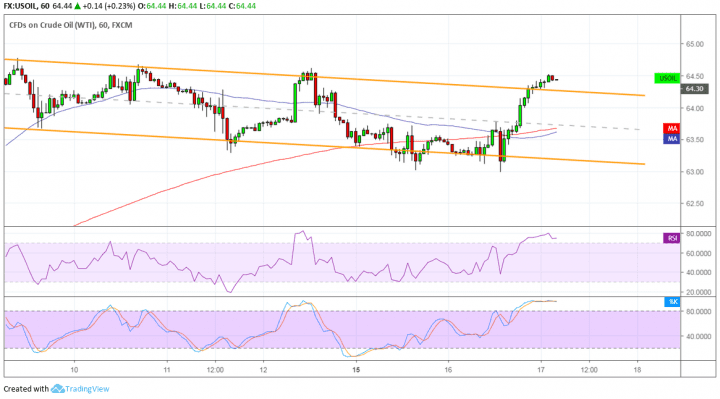 In that case, crude oil might still retreat inside the channel and resume the slide to the bottom at $63 per barrel or the mid-channel area of interest at $63.50 per barrel. RSI is indicating overbought conditions and could be due to turn lower to signal a return in selling pressure as well. Stochastic has been indicating overbought conditions for quite some time but has yet to head south to suggest that sellers are returning. Crude oil made a strong recovery off its earlier slide as inventory data showed a surprise draw of 3.096 million barrels versus the estimated build of 1.8 million barrels. This eases market oversupply concerns once more even as demand may have been dampened by persistent geopolitical risks. Also, recall that Russia raised concerns about the OPEC output deal and how it might factor into losing market share to the US. The prospect of the cartel and Russia also increasing their production could unwind the price gains in the past months, after all. Still, fighting in Libya and conflict in Venezuela kept global oversupply worries in check, at least for the time being. Tensions in Iran are also contributing to lower supply forecasts in the weeks ahead. Another factor to watch out for, though, is the change in global sentiment rising from shifting central bank biases while acknowledging slowdown risks.